It is no secret that I LOVE Christmas music and I honestly start listening to it as soon as it gets cold around September. One of my new favorites is the Restless Heart Christmas album! This holiday season, country music powerhouse group RESTLESS HEART will deck the halls with a brand new Christmas album. 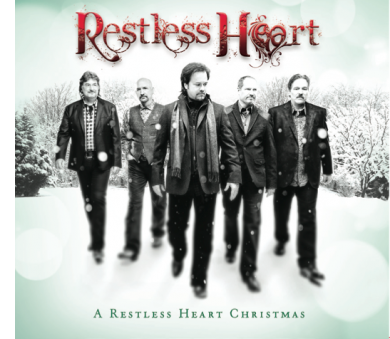 Restless Heart's John Dittrich notes, "We recorded some of our favorite Christmas standards like 'O Holy Night,' 'Jingle Bell Rock,' and 'Angels We Have Heard On High.' We also included 'Silent Night' which we recorded a cappella with a 'Take 6' style arrangement." The ten-track album, produced by Restless Heart's very own Greg Jennings, contains eight holiday classics and two previously unreleased songs. A Restless Heart Christmas is the first-ever holiday album to be released in the band's illustrious 30-year career, which may be surprising to some. Larry Stewart, John Dittrich, Greg Jennings, Paul Gregg and Dave Innis, the men who make up Restless Heart, have enjoyed one of the most successful careers in Country music history. The band has placed over 25 singles on the charts, with six consecutive #1 hits, four of their albums have been certified Gold by the RIAA, and they have won a wide range of awards from many organizations, including the Academy of Country Music's (ACM) "Top Vocal Group" trophy. 2013 marks Restless Heart's 30th year since originally forming the early 1980's. For more information on Restless Heart, visit www.restlessheartband.com.